« How to Pass a Transit Ballot Measure! March 22. The MARC Board approved authorization to execute an agreement with HDR to do the Alternatives Analysis (AA) for the downtown corridor. HDR is an international employee-owned architecture, engineering and consulting firm. They have an excellent reputation working on transit projects and HDR has been heavily involved in streetcar implementation, especially in Portland. They have a KCMO office at 4435 Main. The HDR team includes Nelson/Nygaard, Patti Banks, Burns & McDonnell, Polsinelli Shugahart, HG Consult, and Architectural & Historical Research. “For the purposes of this Alternatives Analysis, the downtown corridor is in Kansas City, Missouri and extends from the Rivermarket on the north, through the Central Business District and the Crossroads areas to Crown Center on the south. This is the center of the bi-state region and includes the region’s largest concentrations of employment, regionally significant activity centers and a growing residential population. 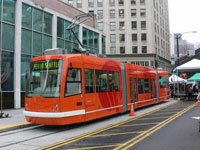 Modern streetcar and a variety of alternatives will be considered to meet the current and future needs. The AA is expected to be completed by Jan 2012. This entry was posted on March 24, 2011 at 3:08 PM	and is filed under Local Transit Issues, Rail, Transit Studies. Tagged: Kansas City, MARC. You can follow any responses to this entry through the RSS 2.0 feed. You can leave a response, or trackback from your own site.